Imagine being able to travel over 750 acres of native bush taking in the spectacular views over Lake Rotorua and beyond. Our Rotorua Adventure Playground trails are made from old forestry tracks dating back to the 1930s. Winding between totara, rewarewa and tawa trees, the native trees cast long shadows all along the trails. You can either ride at pace on our new 4×4 self drive buggies or take things a little slower in the four wheel drive buggies which will be driven by one of our professional guides. Whether you are after an adrenaline-filled off road experience, a stunning scenic horse trek or simply some fun with a gun claybird shooting, our Rotorua Adventure Playground is the place to be. All activities take in the spectacular scenery overlooking Lake Rotorua and our beautiful native bush set on Mount Ngongotaha. We pride ourselves for putting safety first, and then fun, fun, fun and more fun! We love what we do and we know you will too…. Dedicated Range with Outstanding Views!! Family Friendly. Car Seat Compatible! We can’t wait to show you around our little 750 acre Rotorua Adventure Playground !! Give them something memorable this Xmas!! 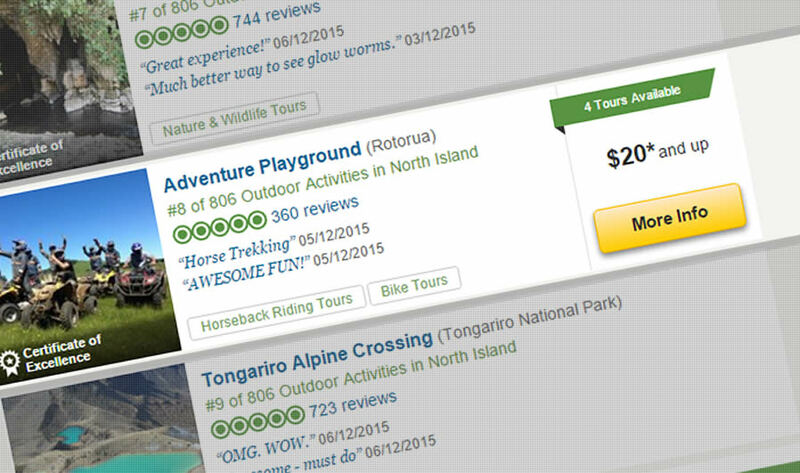 A Tripadvisor Top 10 North Island Activity! We operate in all weather conditions and provide our customers with wet weather gear when necessary. Covered in shoes are essential and warm clothing in winter is recommended. Our Claybird Shooting range is a dedicated, covered facility and is suitable in all weather conditions. Rain does not stop play at Adventure Playground! !